Blue Faucet Lights with LEDS how cool. Need something to make your kids brush their teeth? Tired of having to actually turn on the bathroom light to clean up in the middle of the night? If so the Blue Faucet light is for you. This little guy turns on when the water is on and off once the flow stops. What could be easier. 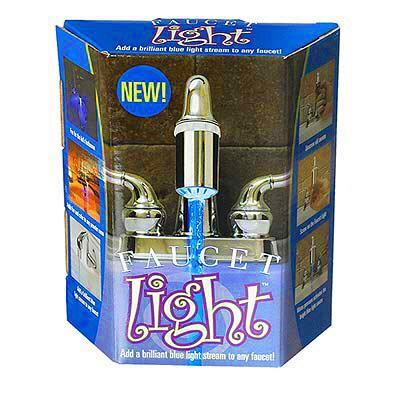 The Faucet Light is great for kids of all ages and adults. The Original Blue Faucet light is Hog Wild cool. 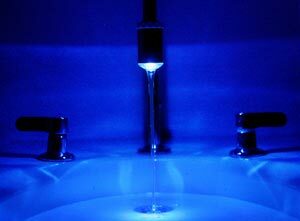 The water activates this LED turning the water a bright blue. Turn off the water and out goes the light. It's great for getting the little ones to wash their hands, perfect for running the water in the middle of the night, and just a hoot anytime. Installing the blue faucet light is so simple that problably a monkey could do it but don't quote us on it. We would guess you won't need your plumber though. 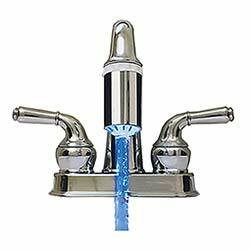 It should take you less than a minute and easily connects to almost all standard household faucets. 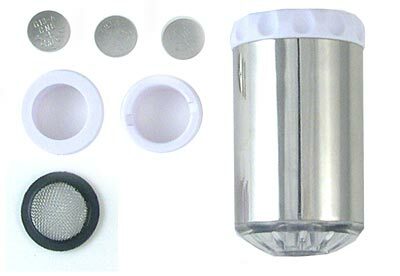 Set includes 3 button cell batteries, wire screen, and 2 universal adapters. About 2.25" long.